The Senate met in a rare Sunday session on July 26, and their chaplain began the day by asking that God grant the Members “truthful lips”. They needed it. Texas Republican Senator and Presidential candidate Ted Cruz recently illustrated why elected officials need to be scrupulously truthful. Democracy is impossible without it. The Highway Trust Fund is set to go bankrupt at the end of this month, and the Senate passed a bill to prevent that. During the debate an amendment to reauthorize the Export-Import Bank, which some Republicans criticize as corporate welfare, was offered. On Friday, July 24, Senator Ted Cruz, a Texas Republican and presidential candidate, went to the Senate Floor and alleged that Majority Leader Mitch McConnell made a deal with Democrats to engineer the reauthorization despite telling the Republican Conference that no such deal was made. A number of Cruz’s colleagues denied the Senator’s allegations, and the following week, National Journal published an article parsing McConnell’s statements and actions, concluding, he was not guilty of the allegation made against him. Cruz’s accusation of lying appears to be a direct violation of Senate rule XIX.2, which states, “No Senator in debate shall, directly or indirectly, by any form of words impute to another Senator or to other Senators any conduct or motive unworthy or unbecoming of a Senator.” If it’s not actually a violation of the letter of the rule, it’s certainly a breach in the Chamber’s decorum, and Cruz’s colleagues responded sharply. A number of Republican Senators, including the President pro tempore Orrin Hatch, criticized Cruz on the Floor. More pointedly, he and a close ally, Senator Mike Lee of Utah, were denied roll call votes on amendments they offered. Normally, when a Senator wants a roll call vote on an amendment they need a second from only 11 other Senators. But out of 99 other Senators, including 53 other Republicans, only 3 supported Cruz’s request for a roll call vote. According to Politico, Cruz said the snub was “extraordinary”. But it should have been expected. Hardball legislative tactics invite retaliation from colleagues, but it usually does not come from the Member’s own party. Senator Cruz probably should not expect too much in terms of favors from other Senators in the future. You know, there is a profound disappointment among the American people because we keep winning elections and then we keep getting leaders who don’t do anything they promise. The American people were told: If only we have a Republican majority in the House, things will be different. Well, in 2010, the American people showed up in enormous numbers, and we got a Republican majority in the House, and very little changed. Then the American people were told, you know, the problem is the Senate. If only we get a Republican majority in the Senate and retire Harry Reid as majority leader, then things will be different. Well, in 2014, the American people rose up in enormous numbers and voted to do exactly that. We have had a Republican majority in both Houses of Congress now for about 6 months. What has this Congress done? …This Senate operates exactly the same [as under the leadership of Democratic Majority Leader Harry Reid]—the same priorities. This is so much tedious hogwash. If the “American people” suffer some “profound disappointment”, it’s not because the government fails to enact Cruz’s brand of conservatism. Earlier this year, Gallup reported that 38 percent of Americans call themselves conservative, 34 percent call themselves moderate, and 24 percent call themselves liberal. So, although a plurality do see themselves as conservatives, most do not. More troubling for Cruz and his narrative: The number of self-described liberals has been consistently, if slowly, rising since at least 1992, the earliest date in the report. In fact, in 2014, the very year the Republicans took the Senate, a greater percentage of Americans identified as liberal than ever. The fact of the matter is that there is not some monolithically conservative “American people”. In reality, citizens are actually quite diverse in their opinions, many of whom are not at all depressed because Cruz’s agenda has not passed. Cruz’s narrative of the last few elections is also unrealistic. First, it’s debatable that “very little changed”, but even if that is correct, would it really be all that surprising? It is naïve to think that the House alone could institute a conservative program. And was anyone in 2010 really saying that’s all conservatives needed? No, Republicans were aiming to take the Senate, too, but fell short. With the Senate, conservatives are in a better place—much better—but still have to deal with a Democratic President. Also, Cruz omits another awkward point in his narrative: the 2012 election. The President was reelected and Democrats gained seats in both Chambers, making it even harder for Republicans to enact their policies. There was no way the Republicans could have instituted conservative reforms even if they wanted to. It also shows, whether some of us like it or not, that the “American people” are not clamoring for Cruz’s policies. Do you know who doesn’t have lobbyists? A single mom waiting tables. Do you know who doesn’t have lobbyists? A teenage immigrant like my father, washing dishes, making 50 cents an hour, struggling to achieve the American dream. Do you know who doesn’t have lobbyists? A factory worker who just wants to work and provide for his or her children. They don’t have lobbyists, and so what happens? Career politicians in both parties gang up with giant corporations to loot their taxes to make it harder for people who are struggling to achieve the American dream. In one sense, it’s true that single moms waiting tables and the host of other low-wage workers don’t have lobbyists. They don’t have a lobbyist’s number on the fridge next to their doctor’s and plumber’s numbers. But the reality of how Washington operates is much more complicated. In a broader sense, these and everyone else in the country has representation in Washington in some form. For instance, how many people who fit Senator Cruz’s description would support raising the minimum wage? Plenty of people represent that interest in Washington. In fact, virtually every side of an issue in Washington has its own lobbyists. As we write in Surviving Inside Congress, “We are all special interests. If you own a car or a refrigerator, travel on an airline, watch television, go to church, get sick, eat, fish, hunt, invest in a mutual fund, or have a hard time breathing, you are a special interest, and there are associations and organizations representing you at both the state and the national level.” It’s true that there are examples of a small number of Members and lobbyists who have colluded to violate legal and moral standards, such as the Jack Abramoff scandal that resulted in a Member and several lobbyists who spent time in jail. But it’s also a mistake and an injustice to denounce either class of people wholesale, since the guilty are a statistically insignificant minority. Cruz’s actions have been widely seen as way to appeal to the base and gin up campaign dollars. After all, he is not exactly headed for a landslide when the latest polls show him with somewhere around 3-5 percent in the Republican presidential field. If that is the case, he’s really no more ethical than those he’s criticizing, since the Senate Floor should not be used for campaign tactics. Even if it’s not a campaign ploy—to give him the benefit of a doubt, he could sincerely believes what he is saying, since many or most politicians actually do believe what they say—he fails the people he is trying to help. He’s inflating expectations, and when reality hits, many become disappointed and enraged. 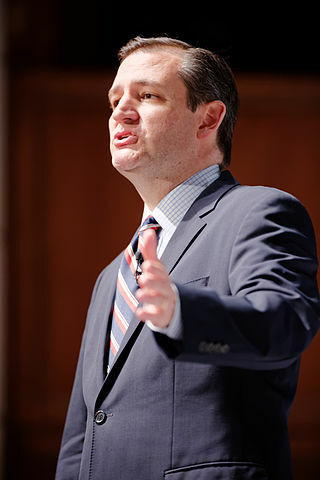 Granted, Senator Cruz is not alone in offering tendentious or inflated rhetoric. It happens all the time in Washington, and all elected officials should strive to be scrupulously accurate in their communications. It’s virtually impossible to vote or govern well without an accurate understanding of reality. And that’s no lie.